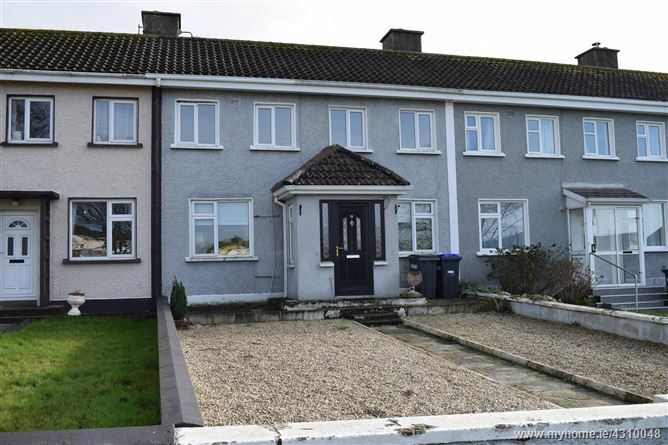 DNG McCormack are delighted to present this lovely 2-bedroom, mid-terraced property in a quiet, settled area of Tullow. In good condition throughout, accommodation on the ground floor comprises of hallway, living room with wood flooring and attractive open fireplace, large dining room with wood flooring, kitchen with cream country-style units and integrated appliances and guest WC. Upstairs you will find the 2 well-appointed bedrooms and family bathroom. There is a good sized garden to the rear with block-built garden shed. Pairc Mhuire is situated just a short stroll from town centre and all local amenities. Ideal starter home or investment property. Tiled floor, modern country-style fitted units, tiled splashback, integrated appliances, back door. Spacious room with wood flooring. Carpeted, built-in wardrobes, 2 windows. Fully tiled floor and walls, WC, WHB, bath, shower over bath.